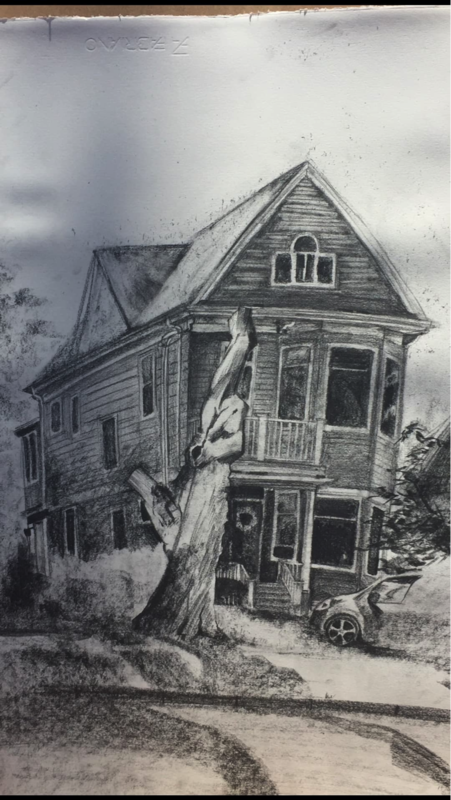 When fourth-year University of King’s College student, Simon Gillies, and his four other roommates were shown a picture of a drawing of their home, they decided they needed to find the artist and pay them for their work. They hope that once the artist is found they can pay for and frame the picture. Gillies posted in the Dalhousie Book Exchange Facebook group hoping to spread the message. No luck. Gillies sat down with The Dalhousie Gazette, in hopes of coming closer to finding the anonymous artist. An image that might be meaningless to the artist is actually special to Gillies. Dal Gazette: Could you tell me how you guys found this picture? Simon Gillies: Sure; so, I went to class one day and my friend Nathan came up to me and said, ‘Hey, I was walking by your house the other day and I saw this girl standing across the street, drawing a picture of it.’ So he went up to her and asked her if he could see the picture, and take a picture of it on his phone. The only information that he got from her was that she is an architecture student at Dal. So he just came up to me one day and said ‘hey I have this cool picture of your house that someone drew.’ So he sent it to me. DG: Could you describe the picture? SG: It looks like its pencil; it’s drawn from the perspective of right across the street from my house. It’s just a picture. It’s a drawing of a three-story house that we live in. We have the top floor of the apartment. The drawing itself is like black and white and it kind of captures that our house is sort of crooked. It captures the kind of crookedness and imperfection (of the house in the drawing). It’s a really cool drawing. DG: Why do you want to find the artist? SG: I showed the picture to my roommates and we all kind of agreed that it would be really cool to have a copy of the drawing ourselves, and buy it from the artist and frame it. I feel like whoever drew it probably didn’t think very much of it, and sort of just drew it off hand. I don’t know if it was for a school project or something like that. I think it would be cool to let them know their art is meaningful for other people, and also just to have a drawing of the house that you live in is pretty cool. DG: In the event that you successfully find the artist, what would you tell them? SG: I’d just tell them that I really appreciate the drawing, that what might have been something that they think nothing of is something that my roommates and I really appreciate. I would offer to buy it off of them, because I think that what they’re doing has value. Gillies asks that if you’re the artist – or know the artist, ask them – to find him on Facebook, or come by the house and knock on the door. Him and his roommates would be happy to talk and let the artist know, in-person, that they appreciate their work.